This past season, Dion Bailey recorded 61 tackles and a team-high five interceptions. As expected, Dion Bailey announced his intentions to enter the 2014 NFL draft on Monday. Bailey mentioned there wasn’t "much more I could prove," at the collegiate level. A rare athlete indeed, Bailey has been an all-conference selection at two different positions — linebacker and safety. The fourth year junior also graduated in three and a half years with a degree in Policy, Planning and Development. This past season, his only season at his natural safety position, Bailey recorded 61 tackles and a team-high five interceptions. He’s been called a ballhawk throughout his career and finished with 11 interceptions as a Trojan. Bailey tells FOXSportsWest.com he reached out to plenty of former Trojans including childhood friend Robert Woods, Brice Butler and Malcolm Smith. He says he will sign with Laguna Hills based agency Athletes First, the same firm that represents Woods. Bailey will head to Miami for training early next month. There has been talk about how Bailey’s game will translate to the next level and he’s even been called a "tweener" by some draft experts. However, multiple websites have the six-foot, 205-pound Bailey going anywhere from the second through the fourth round. Moving forward, USC now loses Bailey and Demetrius Wright at a safety position that had a ton of depth in 2013. Josh Shaw has yet to announce his future plans. If he returns to USC, it could mean a return to safety for the versatile Shaw. Su’a Cravens and Leon McQuay III will also return while Gerald Bowman is also expected to return after being forced to redshirt in 2013 because of injury. 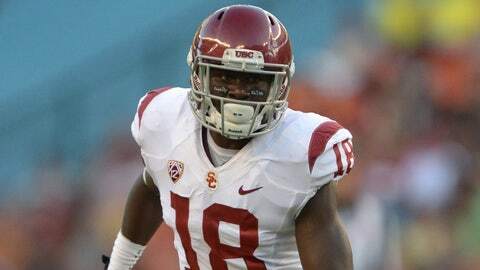 Bailey is the first, but there are still other draft eligible Trojans with decisions to announce including Shaw, George Uko, Randall Telfer and Marqise Lee.